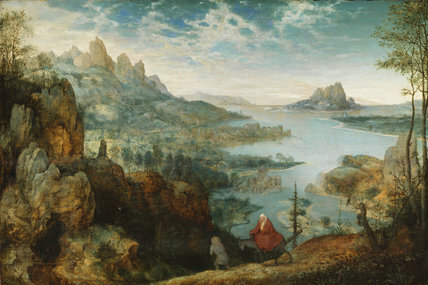 The story of the Holy Family fleeing persecution in Bethlehem is transposed to an imaginary Northern European landscape, above a river valley bordered by craggy peaks. The dramatic setting enhances the religious narrative. The idol tumbling from its shrine in a pollarded willow (to the right of Mary) symbolises the defeat of paganism at the birth of Christ. Bruegel painted this for a major patron, Cardinal Perronot de Granvelle. It was later owned by the artist Peter Paul Rubens.